Extreme Craft: Rockin' Your Box! One of the great exhibitions that we saw over the weekend in San Francisco was Cardburg at Cell Space. 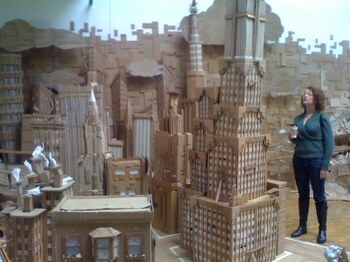 Cardburg, which was devised by the shadowy "Cardboard Institute of Technology", is an expansive installation that exposes the inner working of an entire city-state made of....you guessed it, CARDBOARD! Interpretive signage tells you about the lives, the loves, the myths of this complex city. Nature intrudes on the urban landscape--cardboard clouds, trees....and haunted caves vie for attention from the viewer. The threat of incursion by "Ducksquatch" is omnipresent. This urban tragicomedy will play out in three acts. The ribbon was cut and the city was officially opened for business on April 3rd. On Tuesday, April 10th, the Cardboard Institute will present "Corruption", an inevitable by-product of the cash meeting the cardboard. Finally, on April 18th, the "End of Ages" will come. A Cell Space volunteer was a little too enthusiastic about this one...which will involve much dancing and destruction. I created this mini-photo gallery of my best Cardburg photos on Flickr. A man could lose himself in Cardburg. LOSE...HIMSELF...IN CARDBURG.